For the third layer sprinkle the apple crumble mixture on top of the carmel layer. Continue layering by repeating steps 2-4. There seems to be something missing from this recipe if you look at the picture. The directions tell you to fold in the whipped cream with your caramel sauce. Then you are to start with a layer of mousse, then caramel sauce and then apple mixture. 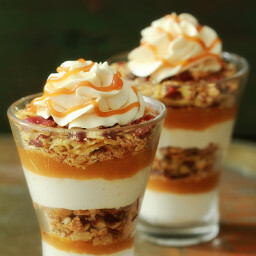 Okay, if you fold the caramel sauce into the whipped cream, where is the mousse recipe ? Because the picture shows the whipped cream between the layers There is a white layer, look at picture. I am going to have to use more whipping cream for the mousse the recipe calls for. Not good directions.